Reigning champ Miller Anderson of Hall captured the LL crown with a time well behind his season's best of 2:30.98 to help lead his team to the Class title. Anderson will be seeking to defend his crown against M winner Rhys Hammond of Stonington who ran the fastest seed time with a 2:31.80 and was followed in by Branford's Marzio Mastroianni at 2:32.92 there. 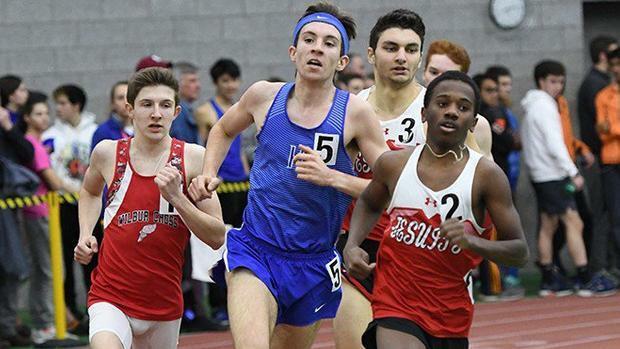 Also strongly in the chase are M winner William Curran of Xavier and LL runner-up Mahammed Hussain of Wilbur Cross who both ran 2:37.51 in the Class meets, and two guys who have gone sub 2:35 during the year, Michael Stamm of Northwest Catholic and Samuel Wilcox of Glastonbury. Wilbur Cross's Travis Martin won the LL race with a 4:19.79 to establish himself as the favorite for States. LL runner-up Trey Cormier of Hall ran to a 4:22.05 in the race and he is expected to have another tussle with Martin in the CIAC. Among the other big challengers in the 1600m are L winner Samuel Whittaker of East Lyme at 4:23.00 and L runner-up Matt Lecky of Middletown at 4:24.28, Edward Tristine of Fairfield Prep at 4:24.30, and M winner Nick Sinofsky of Suffield who has a converted best time of 4:22.05. The top three seeds all come from a fairly tight LL race that saw Danbury's Jacob Hefele win in 9:21.83, with Hall's Trey Cormier picking up his second 2nd at 9:24.48, and Kabir Chavan of Ludlow in 3rd at 9:25.53. The top 3 from the L race should also be mixing it up for the places, with Xavier's Robbie Cozean at 9:26.18, Eli Nahom of New Milford at 9:27.23, and Amity's Connor Visnic with a CT #2 time of 9:23.71 from his win in the SCC meet. Freshman Aidan Puffer of Manchester finished 4th in the LL at 9:26.19 and could get up for a precocious place.